In December 2018, I pulled a stunt. Not only did I live to tell the tale, but I learned valuable lessons that hold true even today. Creating live videos on my Facebook Business Page for 12 consecutive days taught me firsthand the power live video content wields for communicators. Interested in creating live videos on YOUR Facebook Business Page? Download my FREE guide with the topics GUARANTEED to connect with audiences. This isn’t the kind of stunt that makes you cringe when people bring it up at cocktail parties. There are people who have gone live for 30, 60, 90 days — and even some who have gone a whole year without missing a single day of broadcasting. As far as social media stunts go, a Facebook Live streak isn’t even in the top 100 of the craziest. Remember the ice bucket challenge? Or the time when Payless tricked fashion influencers to pay designer prices for budget shoes? Those were way crazier than 12 days of Facebook Live. But creating live videos on my Facebook Business Page for 12 days caught my audience’s attention. Why? Because for most communicators, using Facebook Live just ONCE feels like a crazy stunt. 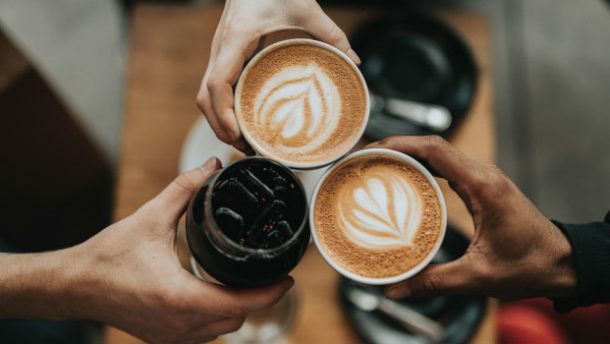 No matter their personality or style, all communicators deeply care about connecting with their audiences. And not being able to edit and perfect their message and delivery during the broadcast can simply be a little crazy-making. Speaking on Facebook Live not the same as speaking on a stage in front of a crowd, where you can make eye contact with your audience and know if your delivery is hitting the mark or missing it by a mile. The only energy in the room when you’re broadcasting live is the energy you make for yourself. It can be daunting. The other aspect of live video that makes communicators nervous is that every mistake you make is out in the open for anyone to see, criticize or mock. And the only way you’ll even know about it is if the critic calls it out. You’ll never know what they say about you offline. For speakers and writers who are used to working on talks or articles, practicing and editing until they are polished to perfection, the imperfect nature of live video seems like reputational suicide. Why put yourself in a position to have your viewer count every filler word or stutter? To call you out when you roll your eyes because you lost your train of thought or to point out your unruly hair, ill-fitting blouse or smeared lipstick? What if it goes VIRAL?! I went live on Facebook for 12 consecutive days to prove a point: None of that matters. Live video is like dinner theatre. The mistakes that occur are part of the show. They’re charming and disarming. Social media audiences crave authenticity and live video content delivers. Creating live videos on my Facebook Business Page taught me live viewers are the most forgiving audience around so long as they see value in what you offer. Bring value to your live broadcast and everything but technology glitches can be forgiven. Aside from being a fun stunt, there was a method to my madness. The strategy behind creating live videos on my Facebook Business Page for 12 days was to bring instant and consistent value to my audience — communicators just like you who want closer, connected relationships as they grow their platforms. Knowing my ideal client values quality over quantity in the people who follow them or subscribe to their email lists, I set out to share information that would bring viewers closer to their own speaking and writing goals. My goal with this series of live videos was to lead by example, showing communicators how to leverage Facebook Live to grow their fanbase in a meaningful way. The process was dynamic. As I focused on bringing value to my viewers, I received value in return — and I learned a lot along the way. Want to go live but unsure of what to say? Check out my FREE guide to Facebook Live. Facebook prioritizes live content, which means Facebook will put your live video at the top of the newsfeed for your followers and your friends while you’re broadcasting. Facebook also directs your live viewers to engage with you by commenting and encourages them to share your live broadcast with their friends. These little message blurbs only show up for your viewers while you’re live, and they are effective. There is no price tag on the value of this free advertising. Live video makes Facebook work for you FOR FREE. But there’s a catch: You have to broadcast for 10 minutes before Facebook will start promoting your live video. It takes time for your live video to get noticed in the algorithm and for Facebook’s elves to start telling people about it. Creating live videos on my Facebook Business Page taught me quick 2-minute videos might be the way to go with pre-recorded content, but the opposite is true for live content. In my 12-day experiment, I achieved optimal results with 30-minute videos. My shortest broadcast was 23 minutes and my longest was 56 minutes. My viewer count increased (and sometimes doubled) between 11 and 20 minutes. In every video that went longer, I noticed a decline in viewers starting at the 30-minute mark. Longer videos, though, were the best at attracting new eyeballs – viewers who weren’t already familiar with me or my page. I don’t have hard data, but I assume this happened because 20 minutes of viewer engagement caught the newsfeed attention of my viewers’ friends. Adweek reports Facebook Live videos are viewed three times longer than pre-recorded video content. The longer someone watches you on video, the more connected they become. Seeing you live on Facebook is the next-best thing to seeing you live in person. Viewers see your expressions, your body language and hear the changes in your tone of voice. These communication cues are connectors. They build that know-like-trust factor we’re told converts passive followers to passionate fans. After watching my live videos a couple of times, viewers appeared noticeably connected to me. They started asking deeper questions and even tagging me to catch my attention. Creating live videos on my Facebook Business Page gave me instant credibility. Even after just a few minutes, viewers considered me a subject matter expert. I also noticed these viewers staying with me longer as my consistency on Facebook Live increased. For example, someone who caught a few minutes of my second Facebook Live stayed with me for the entirety of broadcasts 5 through 8. Facebook Live videos get 10 times more comments than pre-recorded video content. That means for every comment you get on an uploaded video, you’ll get 10 on your live broadcast. People comment on live broadcasts because they know you’re paying attention. They are counting on you to see what they post and to respond. It’s a direct link to you, and it give you a direct link to them. Not only do they get to engage with you, but they also get to engage with each other. It’s not the same as the energy you feel when you’re on a stage speaking, but it’s more dynamic that posting a status update and waiting for people to chime in on their own time. Creating live videos on my Facebook Business Page increased my audience loyalty, and viewers started sharing the videos and tagging their friends in the comments. This didn’t start happening until the fifth day, but the frequency increased all the way to the 12th broadcast. Social media is a bit of a moving target. For many communicators, it feels like a lot of investment with no measurable return. Business insiders say Facebook Live has a dollar value. Industry experts say you can attract clients, sell products and draw income from live video, but can YOU? I think every communicator wonders if he or she can expect the same return on investment (ROI) as someone with a product to sell. For communicators, ROI isn’t always measured in dollars and cents. A positive return might be booking a speaking engagement, an invitation to guest post on a popular blog or a mutually beneficial opportunity to collaborate with another communicator. In creating live videos on my Facebook Business Page, I picked up three new clients, received four speaking inquiries and attracted the attention of prospective collaborators. The booking conversations that came from the live videos were also different. 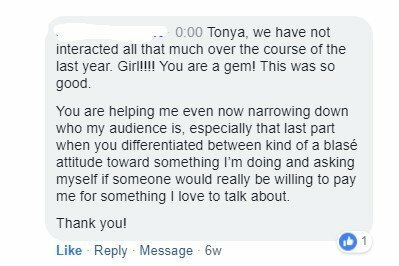 Instead of me feeling like I was in the hot seat to prove my worth to the client or event planner, they were already convinced I was the right person for them. Our one-on-one conversation just confirmed it. Maybe it’s the result of our reality-TV culture, but people love zany and crazy. The thing is that stunts don’t have to be crazy-dangerous or crazy-embarrassing to get noticed. They just need to be a little outside of the comfort zone of the people whose attention you’re trying to capture. Publicly declare a self-imposed challenge that your target audience can’t ignore, and they’ll show up to see what happens. I was shocked at the number of people who came to cheer me on and ask how they could help. Initially, I had planned for 12 live Tonya monologues, where I talked to the camera for 20 minutes without a break. Instead, all but two of my broadcasts were interviews. That’s how many people showed up to support me. Funny story: many of the communicators who volunteered to join me said they wanted to try Facebook Live but were scared to face an audience alone. Going live with me helped them to feel safe enough to go for it. The hardest part about creating valuable live video content is figuring out what to say. Download Nine Ways to Establish, Engage and Grow Your Community with Facebook Live. It’s free and it guarantees you never run out of topics. Just six weeks before I launched my 12 Days of Facebook Live personal challenge, I nuked my online presence. When I unveiled my new brand and redesigned my website to focus on my community-building services for communicators, I deleted all Facebook followers and posts. I put myself in the position of many of my coaching clients, starting from zero. 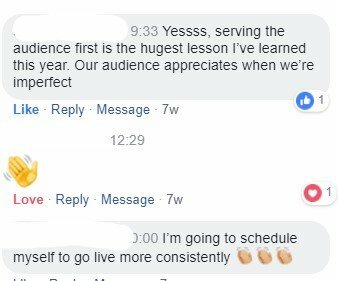 This means that the lessons I learned from creating live videos on my Facebook Business Page applies to you, even if your audience is small right now. By the time I started my 12-day challenge, I had about 170 Facebook followers. On the final day, I had picked up more than 30 followers and crossed over into the low 200s. Not record-breaking results, but the spike in engagement I experienced during my streak has sustained itself. My current rate of follower engagement is still double what it was before I went live for those 12 days, and I haven’t done any live videos since. That will change soon, but it’s worth noting that the positive results from going live 12 days in a row have been maintained for almost 90 days. And as of writing this, I’m up to 300 followers without paying for any promotions. 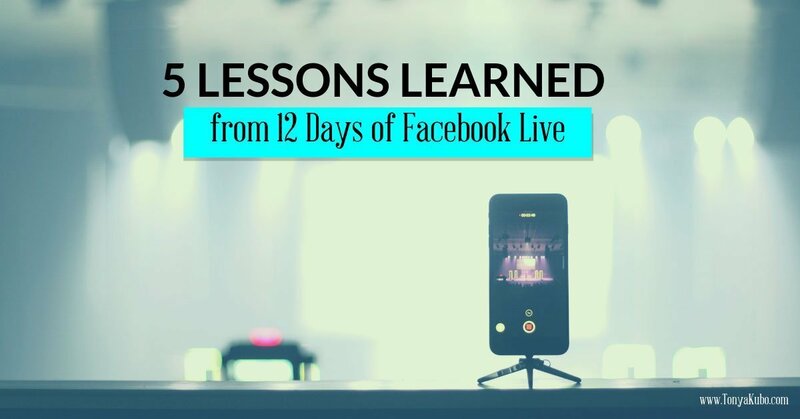 Not everyone wants to pull a stunt like me and produce a streak of live videos, but every communicator can benefit from my lessons learned on Facebook Live. Creating live videos on my Facebook Business Page taught me one big lesson: If you’re going to try this and hope to get similar results, you MUST do it on a Facebook Business Page and not on your personal profile. Many communicators go live on their personal profiles because their reach is bigger but those communicators miss out in a BIG WAY. Facebook Live is a powerful, free tool available to everyone with a Facebook account and a solid internet connection. But as a professional communicator, you need to track and measure your results. Only Facebook Business Pages offer the insights necessary to help you make informed decisions as to whether creating live video is effective. Whether it scares you or excites you, Facebook Live is an unprecedented opportunity for you to bring value into the lives of your audiences and grow your platform in a meaningful way. Even going live a couple times a month can expose you to viewers you wouldn’t otherwise attract with static page posts. Don’t believe me? Try it. The only way to see whether Facebook Live builds credibility among your audience and garners greater loyalty is to try it a handful of times and experience the results for yourself. Tonya Kubo is passionate about building community in digital spaces. She applies digital marketing strategies to help communicators cultivate connected relationships with their audiences. 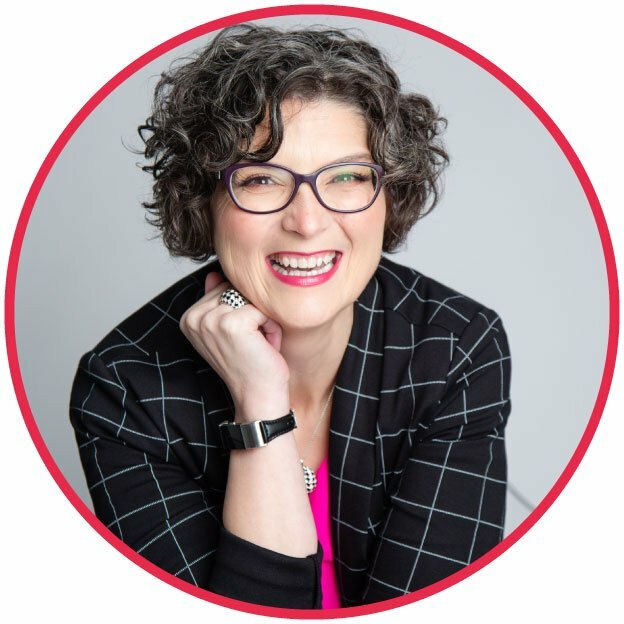 She is the founder of Kathi Lipp’s Clutter Free Academy Facebook group and a frequent guest on the Clutter Free Academy and Communicator Academy podcasts. In addition to offering coaching services, she leads book launches, manuscript development teams and manages online communities. Check the services page for more information.